Bollywood celebrities put their stylish foot forward to celebrate a night of fashion, glamour and style. Take a look at who wore what. Sonam Kapoor and Deepika Padukone at Filmfare Glamour and Style Awards. Bollywood's night of glamour and style deserves everyone's attention including that of the film industry's top stars. At Tuesday night's Filmfare Glamour and Style Awards, both Deepika Padukone and Sonam Kapoor upped the fashion game for others - Deepika in Jean Louis Sabaji couture while Sonam gave Shehlaa saree a chic twist. Sonam and Deepika's chutzpah gave them an edge above the other red carpet looks. Karisma Kapoor, Janhvi Kapoor, Shilpa Shetty, Sunny Leone, Bipasha Basu and Sophie Choudry wore embellished gowns. Vidya Balan and Rekha stayed close to traditional looks. Deepika Padukone carried herself with utmost grace in Jean Louis Sabaji asymmetric gown. She finished out her look with minimal accessories, a sleek hairdo and a nice shade of pink lip colour. Deepika Padukone was named the Most Glamorous Star (Female). Sonam Kapoor, styled by her sister Rhea Kapoor, looked stunning in Shehlaa saree paired with a train-belt, exaggerated balloon sleeve-gloves and a fishnet hat by Philip Treacy. She won the Most Stylish Star (Female) award. Karisma Kapoor, who picked the Trailblazer of Fashion award at last night's event, walked the red carpet in a sheer and sequinned dress by Tony Ward. Kajol, who was awarded the Timeless Beauty trophy, looked stunning in a yellow La Bourjoisie dress. A quirky smile and diamond ear loops finished out her look. Janhvi, who was named Emerging Face of Fashion, dazzled in a Yousef Al-Jasmi while Brahmastra actress Mouni Roy looked pretty in a soft pink outfit with pleated skirt. Shilpa Shetty picked an embellished Julien MacDonald gown while Diana Penty opted for an edgy Shriya Som creation. Preity Zinta made a splash in red while Bipasha Basu wore an outfit from her friend Rocky S' collection. Vidya Balan, dressed in a black saree, played safe while Rekha ditched her usual kanjeevram saree in favour of a chikankari suit. Rekha was named the Ultimate Diva. Second day in row, Surveen Chawla dressed her baby bump in style. After attending Ekta Kapoor's party in a shimmery suit, the Hate Story 2 actress wore a layered dress to last night's event. Rakul Preet showcased another piece from Tony Ward boutique while Saiyami Kher wore a sheer and embellished outfit. Warina Hussain, who debuted in Loveyatri, picked a stunning dress from the racks of Sarah AlAbdallah. Sophie Choudry shimmered in Swapnil Shinde. Prateik Babbar arrived with his wife Sanya Sagar, who looked gorgeous in red. Sunny Leone and Daniel Weber had eyes only for each other on the red carpet. We also spotted Kim Sharma and Harshvardhan Rane there. 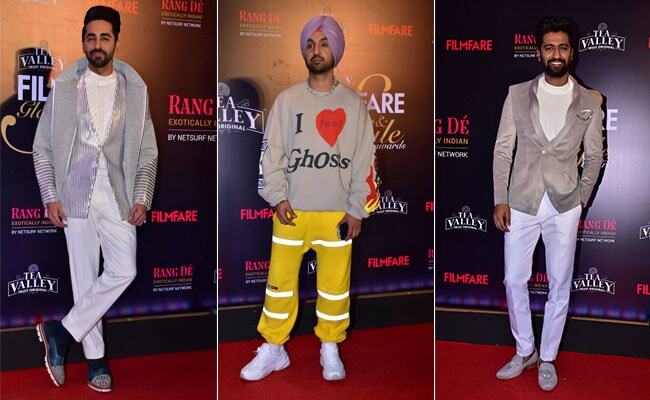 Shahid Kapoor and brother Ishaan Khatter, Kartik Aaryan, Ayushmann Khurrana, Vicky Kaushal and Diljit Dosanjh were among the stylish men on the block. Tell us which celebs' fashion game you liked the best in the comments section below.